Parat+ offers a preset system for both fader setups and recorded gestures. Tap on ‘save’ to save the current fader setups into the selected preset slot. Tap on ‘read’ to read the setup the faders according to the saved setups. MIDI channel and controller number. Fader minimum, maximum and curvature. Parameter range send over OSC. Minimum and maximum value of the fader calibration. OSC address of ‘Value controlled by’. OSC address of ‘Minimum controlled by’. OSC address of ‘Maximum controlled by’. PLEASE NOTE: currently all fader setups are saved and read simultaneously. A future update of Parat+ will offer read/save functions for individual faders. All values stored in the gesture player of each fader. PLEASE NOTE: currently each gesture of all faders are saved and read simultaneously. 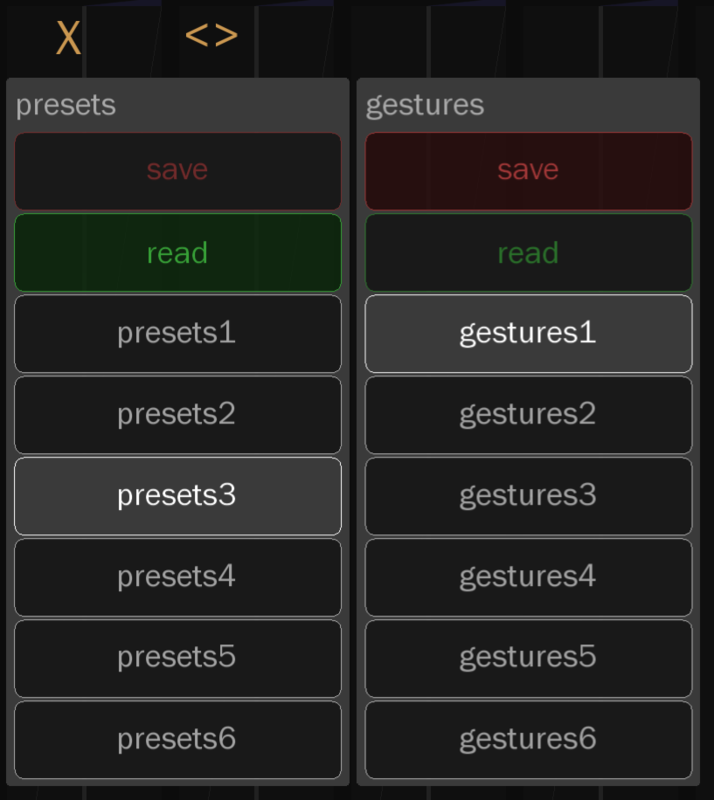 A future update of Parat+ will offer a gesture read/save/copy/edit functions for individual gestures. In Parat+ the fader setup and recorded gestures are saved and retrieved separately to allow the same gestures, patterns and structures to be used independently of faders being adapted to suit any changes made to the parameters of controlled processes and devices.